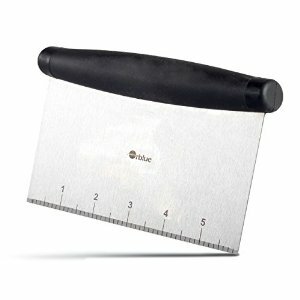 Scrape and chop bread or pizza dough with the stainless steel pastry cutter. Your knife is not as good as a bench scraper to chop and transport food off the cutting board and into the pan. Good Grip – Comfortable non slip rubber handle absorbs pressure. Hold your metal pastry chopper and note how comfortable it is. Easy cleanup – Cooking can’t get any easier. This pastry scraper is another dishwasher safe tool set in your kitchen.